1. Boil the grains in salted water for 15 minutes until tender, then drain well. Meanwhile, toss the rhubarb in a large bowl with the vinegar and 1 tbsp orange juice, the honey, garlic, oil and some seasoning. Set aside for 10 minutes. 2. Toss the hot grains with the rhubarb mix and set aside for another 5 minutes to cool and let the flavours absorb. Just before serving, finely chop the coriander stems and the leaves from both herbs. Fold them with the orange pieces through the salad. Season. Flake the fish and scatter over the top to serve. 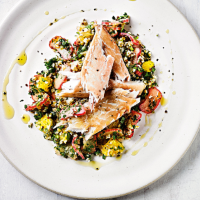 Cook’s tip As a weeknight treat, swap the mackerel for Waitrose 1 Yellowfin Tuna Steaks instead. Just sear, then serve. High in omega 3; 1 of your 5 a day.